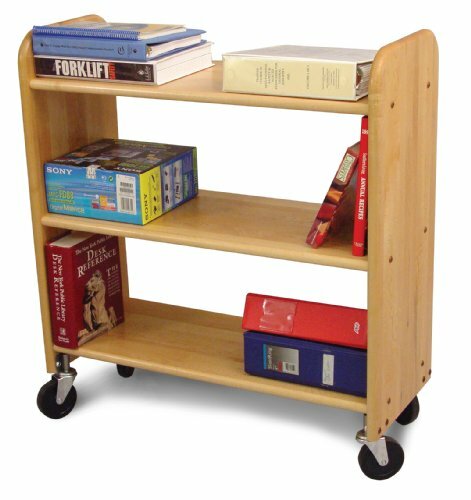 Save 1% on the Catskill Craftsmen Library Book Truck with Flat Shelves, Natural Birch by Catskill Craftsmen at Momiji Studios. MPN: 3314. Hurry! Limited time offer. Offer valid only while supplies last. Catskill Craftsmen has become the nation's leading manufacturer of ready-to-assemble domestic hardwood kitchen islands, carts, and work-centers. Catskill Craftsmen has become the nation's leading manufacturer of ready-to-assemble domestic hardwood kitchen islands, carts, and work-centers. Catskill Craftsmen manufactured items are made from naturally self-sustaining, non-endangered North American hardwoods, primarily Northern Yellow Birch. Lumber is purchased from area sawmills, then dried, manufactured, and packaged on site. All sawdust, shavings and waste materials generated during the manufacturing process is converted into wood pellet fuel, and used to heat homes. The Book Truck is ideal for schools, libraries or office where large quantities of books or other materials need to be moved quickly and easily from room to room. Overall Dimensions Assembled: 33.5 in. wide by 14 in. deep by 36 in. high. Natural Birch with Lacquer Finish. 11.5 in. Clearance between shelves. If you have any questions about this product by Catskill Craftsmen, contact us by completing and submitting the form below. If you are looking for a specif part number, please include it with your message.